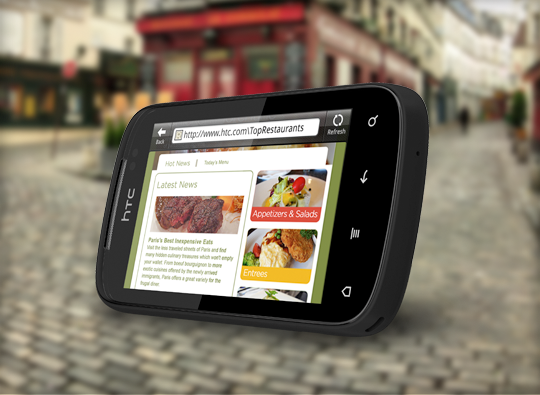 The HTC Explorer is a phone with a simple attractive interface in affordable price range. With a compact body the cell phone only has a 3.2 inch display. It is not suitable for Heavy browsing but activities like twittering, etc can easily be carried out on it. It has 600 MHz processor, that is quite fine for messaging and networking games. Running on Android 2.3 Gignerbread has easily used buttons for the central screen to accomplish all the imperative and necessary tasks. It weighs around 108 grams. The rear of the phone has a rubber casing with a strip of metal down the middle, but is does not provide much shock resistance to the phone. The rubber provides some extra grip. The rubber casing on the back is nice. On the around edge there is a suitable positioning for a power button and a volume rocker. There's also a 3.5mm headphone jack and a micro-USB port for charging or for connecting the phone to a computer. The phone has a 512MB of internal storage and only 116MB of that is usable. MicroSD card provide advantages to take benefit to take photos or download apps. Its 3.2-inch screen has a 320x480-pixel resolution, which is quite poor. HTC Explorer Screen has not a great resolution. The screen is quite bright and handles colors rather effectively. As an Android device, there are good number of thousand apps on Android market to make use of. It is easy on the phone to create an account with the existing Gmail address. The phone is appropriately made for social networking keeping the core objective into the mind. One can be promptly added to the friends detail on the phone. HTC Explorer Facebook automatically adds with the calendar and provides all the recent updates. At the back of the explorer is a 3-megapixel camera. The phone is easy-to-use without any fancy gimmick. Quite beautiful description about the features. This is called attractive and perfect business writing. Excellent post.